Note: While the purpose of this article is to consolidate SD card facts, corruption issues and all of their possible fixes, don't forget to check out the best SD card recovery solution after reading this article. As we move towards the paperless era, the utility of digital storage media has grown manifold. Especially in terms of personal data storage, where individuals commonly rely on extended capacity of portable data storage solutions like SD cards and memory cards. The spur in digitization has transformed SD cards into the most convenient and inexpensive storage media. It provides volatile storage as well as encryption capabilities for protected content too. The latest SD cards are faster with higher storage capacities. They are universally used in camcorders, music players, android smartphones, tablets, digital cameras, and other portable devices. However, SD cards are prone to corruption, accidental formatting or damage, leading to loss of all the stored photos, videos, and audio files in both Windows and Mac. Usually, this situation initiates with an error message. If not handled properly, it might lead you to a permanent data loss situation in which the SD card recovery gets difficult. Moreover, memory cards have a limited lifespan, so after a certain period of usage they are bound to get corrupt or damaged. Yes, your SD card got corrupt if it has any of these symptoms! Most of the photos on your SD cards are missing. When you try to read the SD card through a system, no folder appears, or the folders do not open and show error messages - 'Read / Write error on SD card' that indicates it cannot read from the device. You get error messages reading 'memory card error' or 'corrupt memory card' while trying to access your precious photos or videos stored on the card. Read more on Memory Card Recovery. You are unable to add, delete, copy or save anything in your SD card. There is no guarantee that you will always recover your data back. In the case of physical damage, you may not be able to repair it, but a logical error may be tackled in some simple ways. Wait! Have you tried any of these First Aids/Handy fixes before going further? Determine the type of your SD card; then it may require an SDHC device to read it. At times, some devices like readers and cameras may need software download to read the SDHC cards. Therefore, go to the device manufacturer's website and find out prerequisites. At times, a device may not read an SD card due to incompatibility or driver-related issues. In such cases, try to connect your SD card to another device in both PC or Mac. Insert the affected card into a card reader and connect it to your system. Click on the "Start" option from your Windows taskbar and then select the "Computer” option. Search for your SD card under "Devices with Removable Storage" and note the drive letter assigned. Next, click the "Start" option again and type "cmd" in the "search" box. Right-click "cmd" and then select the "Run as administrator" option. A command window opens, and you can fix your corrupt memory card from here. Next, type "chkdsk" followed by the drive letter corresponding to the SD card, then by a colon and /f. 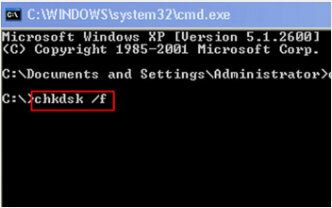 After you press "enter", the Chkdsk will check for possible errors and try to fix the corrupt SD card. Follow the subsequent message prompts. Lastly, check your assigned drive letter to your SD card to verify if the files are recovered or not. 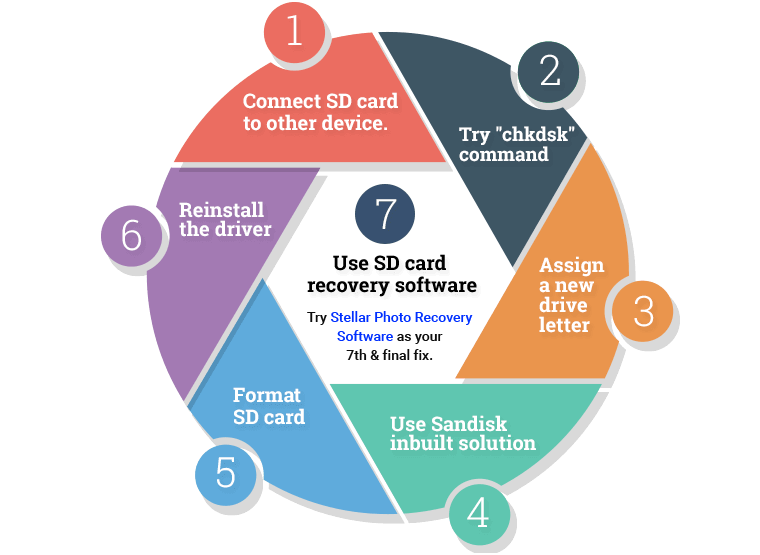 Connect your SD card to a card reader in the system, If your system does not assign a new drive letter to it, then it isn't reading it or the card is unreadable. In some cases, the reader might be assigned a drive letter, but still, you get the message "Please insert the disk into drive E:" indicating that it isn't reading the card. To resolve this problem assign a new drive letter to this connected Card through your operating system settings. If none of the files can be read, then possibly the directory will list the filenames, but the files can't be accessed. You can right-click on the drive letter and select "Properties." If you can view the used space on the card and if it shows all or almost all free space, then either all the files have been deleted, or the directory has been erased. In this case, you can use a Sandisk inbuilt solution that might restore all the deleted files easily. If you can read all the files but cannot save them, then your card might be in write protected mode. Unlock the write-protection switch to save or modify files on the card. If, you are still unable to read or write to the card, then possibly your files are lost or have become inaccessible. To fix it, you need to use a disk diagnostic tool that can work on memory cards too. Although you can also get access to your card by reformatting it, it will remove everything on the card. Therefore, make sure you have recovered all the stored files and copied everything to another drive before SD Card format. In the case of cameras or android smartphones you need to use an SD card Recovery software as most of the files stored on your SD card will be related to photos and other media files. There are some SD card recovery tools available online for both PC and Mac which are efficient enough to offer you the best and accurate recovery results. You just need to choose the right tool and try to restore your lost, deleted and inaccessible files from the SD card. Go to and right click on My Computer/ This PC. Click the Manage option. 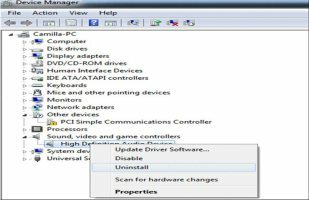 Click the Device Manager option on the left side. Double-Click Disk Drives option from the list. Then Right Click on the name of your removable drive. Click Uninstall and click Ok. Fix 7: Nothing worked? Yes, Recovery Software is your solution! Whenever an SD card becomes inaccessible or formatted, mostly the stored data gets lost. However, all files remain in the same position on the card and can be recovered by a photo recovery software. 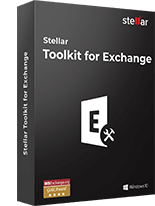 Stellar Photo Recovery Software is specially designed to fetch all the lost photos and other media files from their actual place and make them visible. To restore all lost files from an SD card, make sure the card is not physically damaged. Additionally, stop using your SD card before recovery. Recovery Steps for getting your memories back! 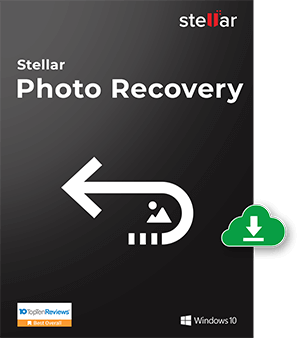 Download for (PC) or (Mac) and install Stellar Photo recovery software. 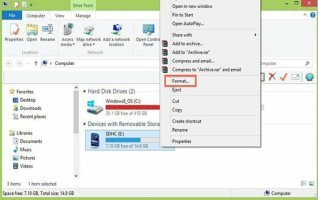 Connect the SD card to your system to initiate the recovery of photos/music/videos from SD card. On the home screen of the software - Select the file type that you want to recover. Click Next..
Next, select the SD card drive location from where you want to recover your files. Click Scan to start the scanning process. You can also click on Advanced Settings to set scan for only required files to considerably reduce the scanning time. The 'Advanced Scan' option lets you select the specific files to scan from the file list such as 'Photo', 'Audio', or 'Video'. Additionally, you can also select the data range from the storage media. These options let you customize the process and minimize the scanning time. After initiating a scan, you will be able to view the process in the scanning process bar. All the found files will be listed in a tree like structure format in the left-hand side window pane. Now, you can preview the listed items by clicking on them. Here, you can also select the desired files and click the 'Recover' button to initiate recovery. The next window asks you to select a location to save the recovered multimedia files. Choose the desired location and save the recovered files. Things to Remember to Protect your SD Card! Do not take or view new pictures on battery low mode. Use SD cards from established brands such as SanDisk, Panasonic, Sony, Kingston, Lexar, Olympus, etc. Capacities of SD cards depend on their models, such as SDSC (SD) cards starts from 1 MB and goes up to 2 GB, where some of them start from 4 GB and go up to 32 GB. Apart from this SDHC starts over 2 GB and goes up to 32 GB and SDXC starts over 32 GB and goes up to 2 TB. All the SD cards work with all host devices that support SD, SDHC, or SDXC cards. SD cards are used by almost all the gadgets that have external memory slots such as digital cameras, camcorders, video game consoles, android mobile phones, and all handheld computers. SD card slot? Do today's devices need that? Along with their various advantages, SD cards also have some shortcomings which encourage OEMs to replace SD card slots with USB ports and internal memory in portable devices. But what if you lose valuable data from such devices which do not have SD card slots e.g like an iPhone? In that case, you can recover lost or deleted data from iOS devices, iCloud backup and iTunes backup with the help of iPhone data recovery software. The software can recover lost or deleted data due to Jailbreaking iOS device, Damaged/broken/lost/stolen iPhone, Water damage, iPhone stuck in recovery mode, stuck at Apple logo screen, factory reset loop, virus attack, black screen/white screen of death, iOS upgrade etc. Moreover, if you have difficulty extracting information from iTunes and iCloud backup or iTunes/iCloud backup is corrupt or not compatible, you can easily choose the selective information and retrieve them in a simple and secure way. It is all about business in the first place, as manufacturers want to reduce the complexity of portable devices by removing the detachable battery and replacing the SD card slot with more internal memory. This change not only reduces the multiple things attached to the portable devices but also increases the hardware price. Limited internal storage does not decrease the use of mobile data, but increase the use of cloud storage and online services, etc. where non-removable battery makes the devices disposable. Q: Is Cloud getting more popular than SD card? The SD card market is flooded with cheap and off-brand cards on various sources. There are many SD cards that claim of higher capacity than they are. SD cards are comparatively slower and unreliable than memory chips. Cloud storage is better than these portable storage devices as they offer better storage options due to which cloud storage is becoming a more viable and easier to use storage source all the time. Q: I am unable to format my 16 GB SD card. It is showing a message to reformat it again. What should I do now? Answer: At first, try to change the card reader or connect it to a different device. If still there's an issue, your card has become corrupt, and you may need recovery software to recover data. Q: How to transfer photos from my phone to my external SD card? Q: Can I recover raw photos from the corrupt SD card in Mac? Q: What should I do after I get error message 'SD card not formatted' while inserting SD card on Camera? Answer: Try to format your SD card in the camera itself if you are ok with losing any pre-existing records. 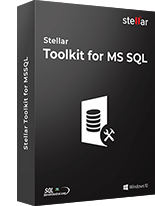 If still not solved, then try the SD card formatting software to format it but to recover your data back, try using Stellar. Q: My Camera is giving the message "memory card locked" when I insert SD card into it. Answer: Please check with the lock switch on the SD card. Correct it and then again re-insert. Q: SD card is not being recognized by PC. What can I do now? Answer: SD cards not being recognized, can be a result of many factors. Recheck the connections. Sometimes cleaning the card reader slot solves the issue. Otherwise, a driver update for your card reader can be the solution. For updating, go to the "Device Manager" section from the task bar of your PC. From there, update the driver online. An another reason can be due to the broken/corrupt card. Q: Can I also recover my word, excel document using SD card recovery software? Answer: No, SD card recovery software i.e. 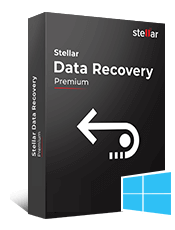 Stellar Photo Recovery software recovers only Photos, Videos, & Music files from hard drive, SD Card, Flash Memory Cards, Pen Drive or any other external storage media. You need to see Hard Drive Recovery Software to recover your documents or any other lost data from any storage media. Q: I am getting an error message "this memory card cannot be used. card may be damaged. insert another card" in Nikon D3200 SD card. How to fix and recover? Answer: In this type of case, the SD card may work in PC, if not in your DSLR. 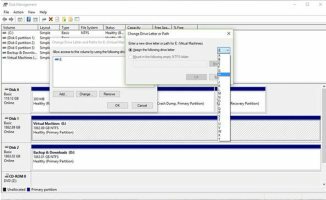 Try to transfer your photos to your PC if possible or else take the help of the above-mentioned SD card recovery software to backup your photos. Next, try to format your SD card in the DSLR itself. Answer: Try our sd card recovery tool to recover your data. Sometimes, it is not the problem of the system or SD card. It may be also because of the SD card slot. The SD card slot may get jammed or blocked by dust or something else also. Sometimes, cleaning it by blowing air into it or with some folded paper may also help to sort out your problem. Q: What to do when you see the message “SD card is mounted read-only” on your device. Answer: Sometimes you need to fix the FAT and for this first you need to connect your device to a computer first. After that open Windows Explorer and then right click on the listed drive to your SD card. 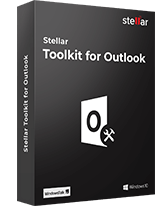 After that select>Properties>Tools>Check Now to automatically fix file system errors. The FAT will get repaired. You can now disconnect your device from the computer and your SD card will not be showing “Mounted read-only” message from next time onward. Q: Getting “SD Card not inserted" or "no memory card" error? Answer: SD cards perform badly sometimes. Important thing to remember is that the card is still usable and the data is recoverable. This issue may be resolved by connecting the card to a computer using an external card reader. If the card is recognized when connected to the computer using an external card reader, back up all data on the card and format the card using the computer. Connect the card back to the device. Once the card is recognized, format the card in the device. 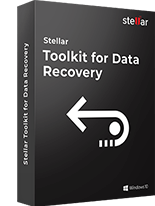 If your memory card is detected in the computer, but there is no data showing, you can try Stellar Photo recovery software for recovering all your multimedia files. Q: How to fix "SD Card unexpectedly removed" error on your Phone? Answer: You can try these simple methods to resolve the error. Unmount and again mount the SD card after rebooting your smartphone. You can also try inserting your SD card to another device to check if the error shows or not. Sometimes, long pressing the power button resolves such kind of errors.